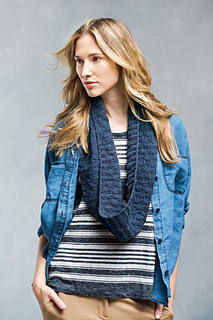 There’s no wrong way to wear this textural cowl. The pattern of garter cluster stitches creates energetic ripples on one side and bubbles on the other. The clusters form over seven rows with the stitch count expanding and then gathering back in, which keeps the knitting adventurous but well within the abilities of the bright-eyed intermediate. 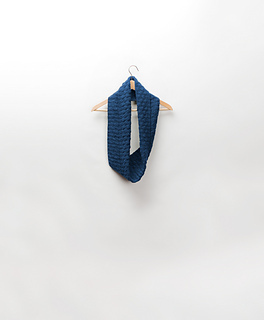 Furl is worked in the round with tubular edge treatments and can be worn loose about the neck or with an extra wrap to keep your throat warm. 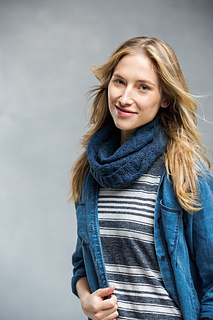 Knit it in two skeins of Loft in your favorite accent color and you’ll have a wardrobe staple to reach for on breezy days. 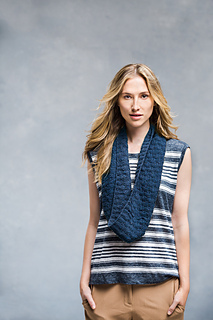 Please note: the stitch patterns in this cowl are charted only.